Mental Health Facility Honors Respected Judge and Advocate Belvin Perry, Jr.
Orange County Mayor Teresa Jacobs and nearly 100 local dignitaries, leaders and guests recently gathered at the Central Receiving Center (CRC), for a dedication ceremony to officially name the facility in honor of former Ninth Judicial Circuit Chief Judge, Belvin Perry, Jr. The CRC is a nationally recognized model among mental health treatment programs. 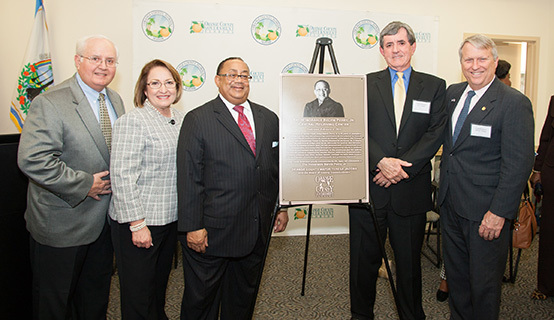 Perry, who remains a widely respected jurist and attorney in Central Florida, was a founding board member of the CRC. He was acknowledged at the ceremony by Mayor Jacobs and peers for his unwavering commitment to the citizens of Central Florida, especially those most vulnerable to harm. Joined by Mayor Jacobs at the dedication was Orange County District 3 Commissioner and CRC Board Chair Pete Clarke, Aspire Health Partner President Jerry Kassab, State Attorney for the Ninth Judicial Circuit Jeff Ashton, Judge Perry and a number of his friends, family and colleagues. According to the National Council for Behavioral Health, one in five adults will experience mental illness in their life. This statistic underscores the importance of having a strong network of mental health providers working together in a community. Since opening in 2003, the Central Receiving Center has treated an average of more than 500 individuals in crisis each month. This treatment diverts people from incarceration, preserves local emergency room resources, helps prevent homelessness, and opens the door to life-saving treatment through a single point of access. “The facility remains a community asset that assists individuals in an appropriate and nonjudgmental way, while also directing patients away from the criminal justice system,” said Orange County District 3 Commissioner and CRC Board Chair Pete Clarke. Originally designed as a resource for law enforcement, the CRC is the immediate answer to the question of what to do or how to help an individual in crisis. Services later became available to an expanded pool of non-law enforcement entities likely to encounter an individual in need of help. While the CRC has been named a national model, there is still more work to be done in terms of supporting individuals living with mental illness and their loved ones. “It is my sincere hope that our governmental leaders will begin to make the funding of mental health services and substance abuse a priority. So many lives are affected directly or indirectly by these diseases,” said Judge Perry after the dedication. The Belvin Perry, Jr., Central Receiving Center is managed by Aspire Health Partners, the lead community provider of public behavioral health services in Central Florida. If you need help, or know someone who does, contact 407-822-5052 for information on mental health services available in the Central Florida community. If you believe that an individual is in crisis, or in need of emergency assistance, please dial 911.